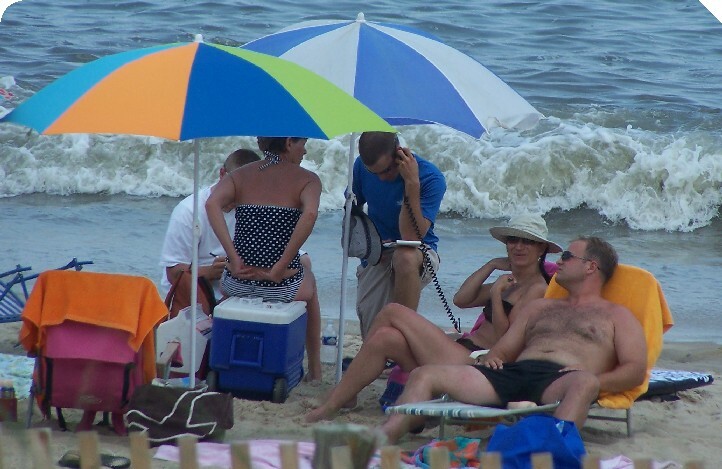 If lounging about on the beach sipping a Corona sounds appealing to you, best not consider doing so in Rehoboth Beach. Wearing T-shirts and shorts, police are once again on patrol blending seamlessly with beach goers. The officers work in pairs and stow their gear in beach bags. Once they spot a violation, they casually introduce themselves and out come the clipboard and radio. Gotcha! 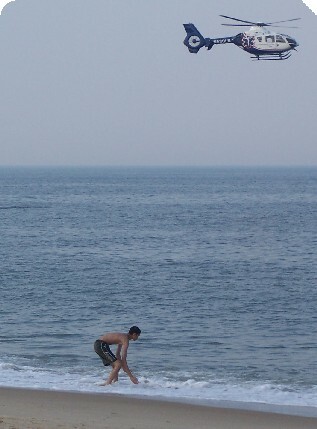 On Saturday, one of the first persons cited was just north of the Henlopen Hotel around 2 p.m. The rest of the afternoon, the officers continued south along the beach catching similar alcohol offenses near Virginia, Rehoboth and Wilmington avenues. Offenders were issued a summons to appear in the city's alderman's court. One of the officers, holding his radio microphone/speaker to his ear, discreetly radios the dispatcher to run a computer check on the offender, and then he requests a report number and the time of issue for the summons. A woman and her adult daughter called 9-1-1 around 6:20 p.m. on Saturday after they said they saw what appeared to be a person bobbing in the water and disappear off Deauville beach. 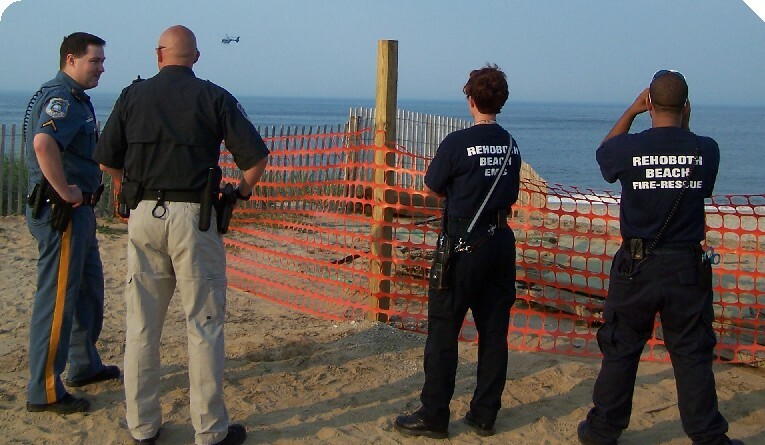 That spawned an hour-long investigation which brought the Coast Guard, Lifenet Helicopter, Rehoboth Beach police and fire departments to the area north of the Henlopen Hotel -- along with a bunch of spectators. No one was found in the water, nor was anybody reported missing as of Saturday evening. The helicopter crew did report some debris and jellyfish floating on the surface. Christiana Hospital's Lifenet II is actually a helicopter intended for medical flights, but has been recently assisting with other missions when the state police helicopter is unavailable. Both are based at the airport in Georgetown. 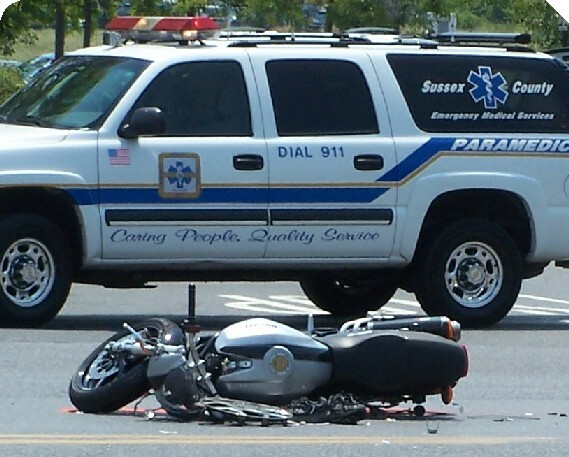 A man riding a motorcycle collided with a Volvo around 11:55 a.m. Saturday. The crash happened on Shuttle Road just west of Route 1, near the Exxon Station outside of Rehoboth. 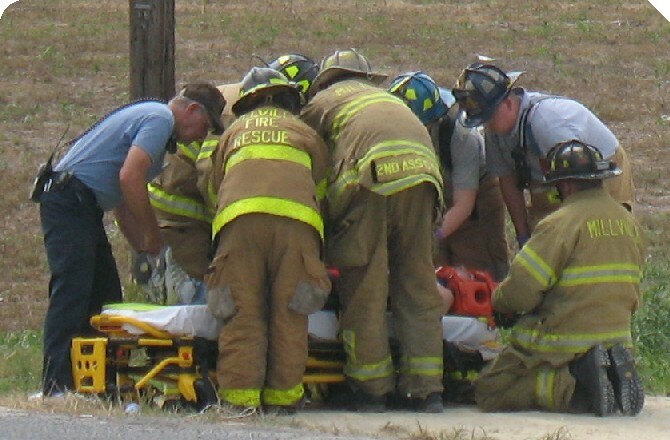 Stephanie Callaway, Sussex County EMS spokeswoman, said the helmet saved the man's life. She helped treat him at the scene, and noted that his head was trapped under the Volvo (the Volvo had been already moved off to the side in the photograph below). Ms. Callaway said she wished more motorcyclists and bicyclists would wear helmets. The state police helicopter Trooper 2 landed next to the County Bank on Route 1 and flew the motorcyclist to Christiana Hospital in stable condition. The occupants of the Volvo were not injured. State police issued this news release late Sunday evening regarding the crash. Words frequently used by Rehoboth Beach visitors and locals this past week included gridlock, bumber-to-bumper and crawling. Perhaps it was because the July 4th holiday ended up on a Wednesday this year. But for whatever reason, Rehoboth Beach hasn't seen congestion like this during the week since last August. A simple trip from downtown Rehoboth Beach to the grocery store easily required an additional 10 or 15 minutes. If you relied on street parking when you got back into town, you probably spent much time searching for a parking space. Rehoboth police responded to several calls for vehicles blocking driveways, and at least one argument over a parking space. Truck drivers making deliveries added to the aggravation of getting around. A couple times, Sgt. Mike Corbin instructed his seasonal officers to disregard issuing traffic citations on Rehoboth Avenue in an effort to keep the traffic flowing. 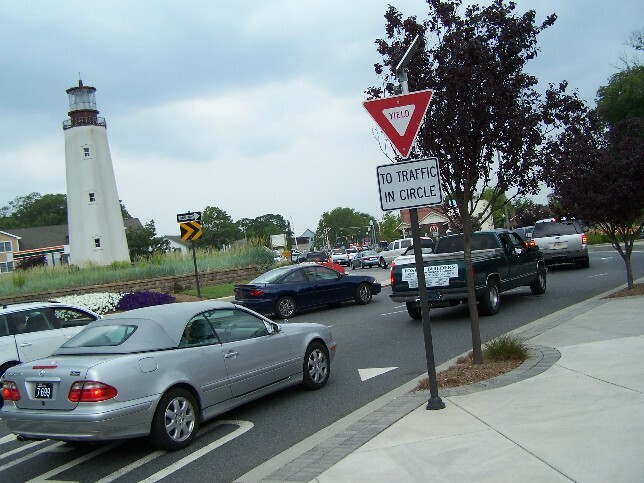 This was the traffic circle on Rehoboth Avenue late Thursday afternoon -- but this was typical of the congestion that started Friday, June 29. 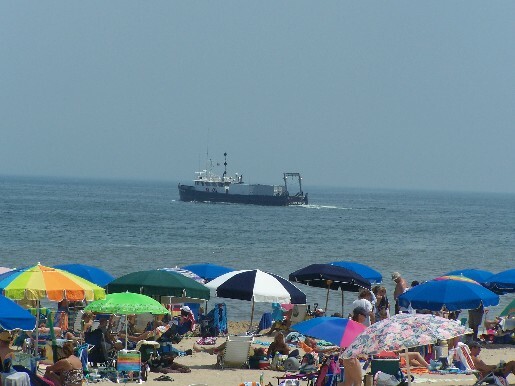 Unauthorized vehicles were reported parked in spaces reserved for Rehoboth Beach lifeguards on Thursday, Friday, Saturday and Sunday. 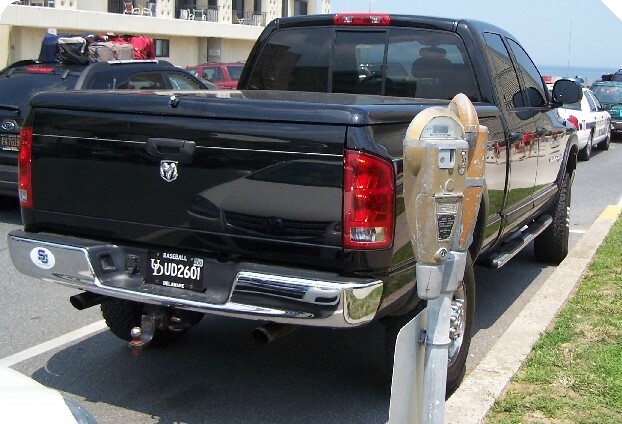 It seemed like a straight-forward tow request when lifeguards reported this Dodge Ram pick-up truck parked in a reserved space on Virginia Avenue around 1:35 p.m. on Saturday. The truck had University of Delaware tags and a placard in the windshield which read: Official Business; Delaware State Police. The complaint had been assigned to a seasonal officer and was given to a full-time officer when they discovered the placard. An officer ran the truck's tag and had hoped to verify if the registered owner or a family member was indeed a state trooper. The truck was not towed. Somebody had fed the parking meter, although the space was reserved for lifeguard parking until 5:30 p.m.
On Friday, the top-less man shown below had left his silver Grand Prix in a lifeguard spot on Olive Avenue, which was reported to police. One passer-by said he was a lifeguard and the man was a friend of his, but that didn't save him. Coastal Towing had already been requested. When the tow truck operator (blue T-shirt and jeans) arrived, he demanded his show-up fee. The man didn't have enough cash and started working his cell phone. He was on the verge of being towed. That's when the man in the white T-shirt stepped forward and offered to help him with a cash advance. There was no time in the parking meter when he drove off around 1:25 p.m.
On Thursday, bicycle, foot beat and community service officers and a lifeguard watch as Coastal Towing removes this Nissan Altima from the lifeguard reserved parking space on Hickman Street around 2:25 p.m. It was reported about an hour earlier. The parking meter had more than 90 minutes remaining when it was removed. And finally on Sunday, Coastal Towing removed this black Lexus RX300 from the west-most reserved lifeguard parking space on Saint Lawrence Street. This space was second to Stockley Street last season for catching the most tows. The sign reserving both spaces is about 17 inches to the east of the center line. The Lexus was reported around 1:35 p.m. and removed at 2:15 p.m. A valid parking permit was displayed in its windshield. An eight-year-old boy was flown to a trauma center after he injured his neck/back in the Ocean City surf. 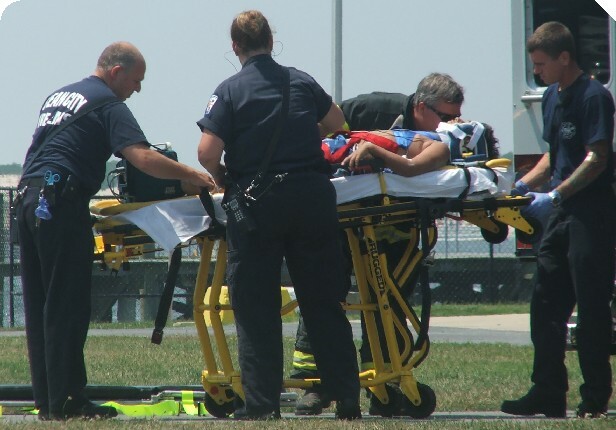 It was reported around 11:20 a.m. Sunday at the Inlet Lot off Row L.
An Ocean City paramedic evaluated the young man and requested a medevac helicopter which landed at the Coast Guard station. The boy reportedly felt tingling in his extremities. He was taken by state police helicopter Trooper 4 to Salisbury. Two other people were injured in the surf this weekend and were flown to trauma centers. The first happened Friday around 3:20 p.m. when a young woman was injured in the surf at 72nd Street. She was complaining of left arm and leg tingling and back pain and was flown on the Delaware State Police helicopter Trooper 2 from Jolly Roger Amusement Park to Salisbury. On Saturday, a 25-year-old man injured his head/neck in the surf on the south side of Indian River Inlet around 3:15 p.m. He was also flown by the Delaware State Police helicopter Trooper 2 to Christiana Hospital. Below: The crew of Paramedic 1-1 unloads the boy at the Ocean City Coast Guard station for his flight to the trauma center. Photo by Christopher Michael Casale, Breaking News Network. Rehoboth Beach lifeguards brought Dewey Beach Patrol Stand #1 to shore around 1:30 p.m. on Friday after watching it float past downtown Rehoboth. They pulled it to shore north of the Henlopen Hotel, where it was retrieved by a crew from Dewey Beach. The stand disappeared either Thursday night or early Friday. 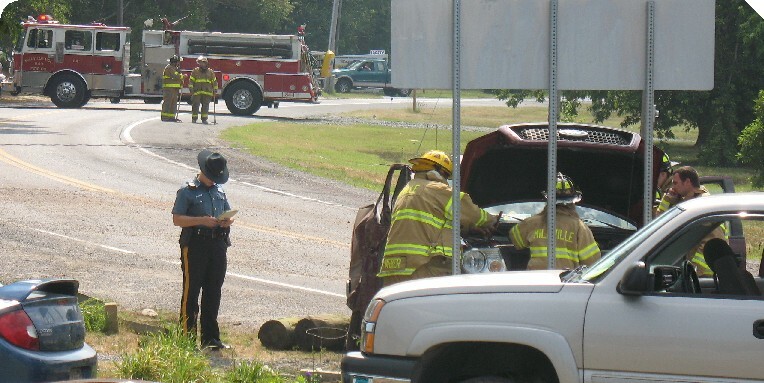 Millville firefighters and Medic 105 removed a 21-year-old man injured in a crash on Omar Road (Route 54) west of Atlantic Avenue (Route 26) in the Clarksville area around 3:15 p.m. on Friday. Stephanie Callaway, Sussex County EMS spokeswoman, said it appears the driver sheared off a utility pole. He was taken to Beebe Medical Center in stable condition. 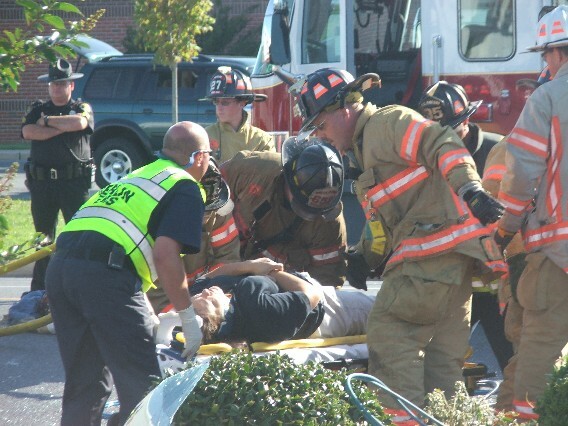 Photos by David Statter, STATter911.com (WUSA-TV). One vehicle flipped onto its side after a two-vehicle crash on Seahawk Road south of Route 50, near Stephen Decatur High School. It happened early Monday evening. 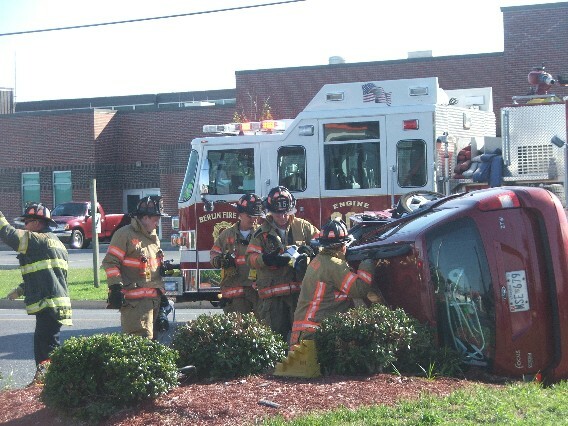 A 49-year-old woman in the overturned vehicle was trapped for about 25 minutes. Maryland State Police medevac helicopter Trooper-4 flew her to Peninsula Regional Medical Center in Salisbury. Photos by Christopher Michael Casale, Breaking News Network. Sussex County EMS opened its new paramedic Station 103 and Special Operations Facility just in time for the July 4th holiday. The new station is at the Country Garden Business Center, 27517 Hodges Lane, Suite O-2, in Dagsboro. According to a SCEMS news release, the movement of Medic 103 from Stockley Center to Dagsboro, as well as the conversion of another part-time unit to a full-time unit in Georgetown, has improved paramedic coverage for all of central Sussex County. The Special Operations facility will provide storage and maintenance facilities for vehicles and equipment necessary to provide coverage for special events, response to hazardous materials, mass casualty and large-scale incidents. 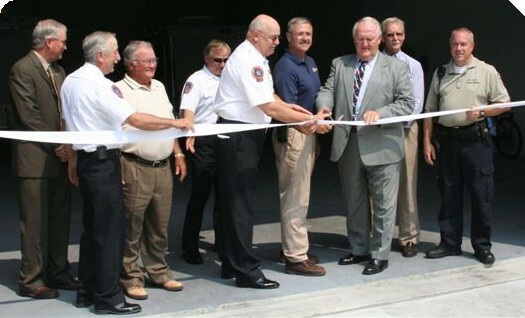 On hand for the ribbon-cutting were (l to r): Dave Baker, Sussex County Administrator; John Kinsley, Division Manager SCEMS; Jack Parker, Country Garden Business Center; Robert Stuart, Deputy Director SCEMS; Glenn Luedtke, Director Sussex County EMS; Lynn Rogers, Sussex County Council; Dale Dukes, President Sussex County Council; Finely Jones, Vice President Sussex County Council; and Brent Hudson, Sussex County Paramedic. For more info, see Sussex County Emergency Medical Services Website. Photo courtesy Tim Cooper, Sussex County EMS special operations coordinator. All weekend long, the crew of the Research Vessel Atlantic Surveyor has been charting the ocean floor between Cape Henlopen and Indian River Inlet -- at times coming unusually close to shore. The crew produces hydrographic surveys for NOAA and the USGS. A report by WLNE-TV about the Atlantic Surveyor's mission has been posted on YouTube.